The ultimate sailor’s paradise — the Grenadines island chain is a land of white beaches, lazy hammocks, swaying palms and rum-soaked bliss. Whether visiting on a private yacht or enjoying a luxury yacht charter in the Caribbean here you can escape the crowds and step back in time. Captain Carl Sputh of superyacht Starfire reveals eight of the best beaches to drop anchor at... 1. Macaroni Beach, Mustique The sea has washed away many famous footprints on this beach, from rock god Mick Jagger to Princess Margaret. Macaroni Beach is one of those celebrity favourite Caribbean destinations, far from the prying eyes of the press and flanked by an oasis of green. Picnic tables sit beneath the splayed fingers of palm trees where world class chefs execute artful dishes. A smattering of millionaire villas hide in the trees and the beach is private so for those seeking to spend a night or two bobbing offshore, you'll need to know someone on the inside or sweet talk your way in. The ultimate sailor’s paradise — the Grenadines island chain is a land of white beaches, lazy hammocks, swaying palms and rum-soaked bliss. Whether visiting on a private yacht or enjoying a luxury yacht charter in the Caribbean here you can escape the crowds and step back in time. The sea has washed away many famous footprints on this beach, from rock god Mick Jagger to Princess Margaret. Macaroni Beach is one of those celebrity favourite Caribbean destinations, far from the prying eyes of the press and flanked by an oasis of green. Picnic tables sit beneath the splayed fingers of palm trees where world class chefs execute artful dishes. A smattering of millionaire villas hide in the trees and the beach is private so for those seeking to spend a night or two bobbing offshore, you'll need to know someone on the inside or sweet talk your way in. The Tobago Cays offer five wonderful wedges of remote island scattered across a lagoon. The beach at Baradal Island is a contender for one of the best beaches in the Caribbean with wonderful coral creating fantastic snorkelling. The Baradal Turtle Sanctuary offers a great spot for watching the green and hawksbill turtles foraging and floating in their seemingly old as time bliss. The Tobago Cays offer five wonderful wedges of remote island scattered across a lagoon. The beach at Baradal Island is a contender for one of the best beaches in the Caribbean with wonderful coral creating fantastic snorkelling. 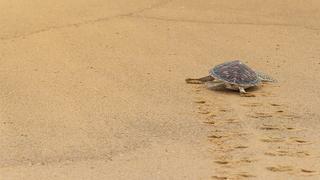 The Baradal Turtle Sanctuary offers a great spot for watching the green and hawksbill turtles foraging and floating in their seemingly old as time bliss. 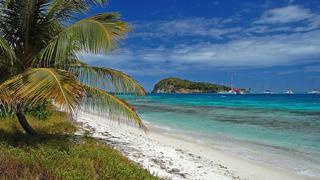 The poster child for the Tobago Cays, Jamesby Beach sits sheltered from the storms. 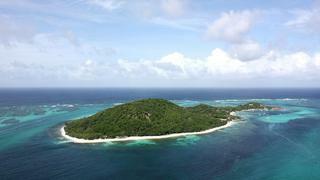 This is the smallest beach in the whole of the Tobago Cays but it is perfectly formed. The sheer cliff on one side peters out and drops beautifully to the single slip of sandy beach with just enough room for spreading out a picnic blanket for a feast of fresh fish, fruits and ice cold beers. Afternoons on Jamesby Beach are all about launching yourself off the swim deck of your superyacht to cool down. Salty and sun kissed you can then stretch out on the aft deck with a cocktail in hand, watching one of the best sunsets in the Caribbean. The poster child for the Tobago Cays, Jamesby Beach sits sheltered from the storms. This is the smallest beach in the whole of the Tobago Cays but it is perfectly formed. The sheer cliff on one side peters out and drops beautifully to the single slip of sandy beach with just enough room for spreading out a picnic blanket for a feast of fresh fish, fruits and ice cold beers. Afternoons on Jamesby Beach are all about launching yourself off the swim deck of your superyacht to cool down. Salty and sun kissed you can then stretch out on the aft deck with a cocktail in hand, watching one of the best sunsets in the Caribbean. 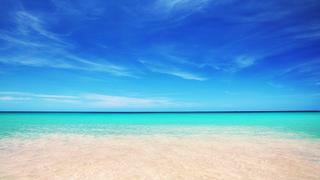 If you asked a child to draw a desert island they would surely create Mopion, a sand spit boasting a singular straw umbrella and iridescent blue waters. Surrounded by a bright and jagged reef, it takes tenders a little care and consideration to make it to Mopion yet, once anchored down, the rewards are plentiful. A five-minute stroll and you have seen all the sights, there is nothing to do but splash and swim and then flop beneath the shade of the umbrella. Those who want a more active afternoon on Mopion can grill fresh lobsters, uncork a bottle of vintage rum and don a snorkel to flounder about on the edge of the shallows. If you asked a child to draw a desert island they would surely create Mopion, a sand spit boasting a singular straw umbrella and iridescent blue waters. Surrounded by a bright and jagged reef, it takes tenders a little care and consideration to make it to Mopion yet, once anchored down, the rewards are plentiful. A five-minute stroll and you have seen all the sights, there is nothing to do but splash and swim and then flop beneath the shade of the umbrella. Those who want a more active afternoon on Mopion can grill fresh lobsters, uncork a bottle of vintage rum and don a snorkel to flounder about on the edge of the shallows. Imagine the most perfect Caribbean island; now add white tailed doves, sun bleached wooden boardwalks, quaint cottages, wild flowers and five star restaurants serving the sweetest lobster you could ever hope to have on the prong of your fork. This is Petit St. Vincent, the unrivalled star of the Grenadines. The island may be private but the resort is often willing to fling open their doors and welcome some of the world's largest superyachts. For those who adore the Robinson Crusoe dream with a few luxury extras thrown in, Petit St. Vincent can beautifully tip the balance. After a refreshing dip into the bright and colourful world that inspired Jacques Cousteau you can let the island masseuse unknot those sun weary muscles. Imagine the most perfect Caribbean island; now add white tailed doves, sun bleached wooden boardwalks, quaint cottages, wild flowers and five star restaurants serving the sweetest lobster you could ever hope to have on the prong of your fork. 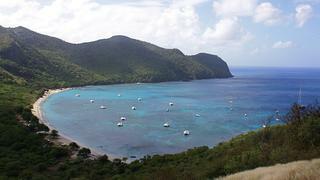 This is Petit St. Vincent, the unrivalled star of the Grenadines. The island may be private but the resort is often willing to fling open their doors and welcome some of the world's largest superyachts. For those who adore the Robinson Crusoe dream with a few luxury extras thrown in, Petit St. Vincent can beautifully tip the balance. After a refreshing dip into the bright and colourful world that inspired Jacques Cousteau you can let the island masseuse unknot those sun weary muscles. The private and prestigious Palm Island Beach is a swim, snorkel and dive paradise. The waters are blue, the sun dapples through the palms, the iguanas sun themselves on the rock and the rum tasting and steel pan parties are the only way to end the day. This is one of those places where swigging ice-cold beer on the sand doesn’t have to be the only thing on the agenda. You can cycle along hidden nature trails, kitesurf and even play a game of cricket. The private and prestigious Palm Island Beach is a swim, snorkel and dive paradise. The waters are blue, the sun dapples through the palms, the iguanas sun themselves on the rock and the rum tasting and steel pan parties are the only way to end the day. This is one of those places where swigging ice-cold beer on the sand doesn’t have to be the only thing on the agenda. You can cycle along hidden nature trails, kitesurf and even play a game of cricket. More rugged than its Grenadine rivals, Union Island is a place where rum shacks pop up, restaurants serve home cooked fare and the best mangoes can be found from a vendor on the side of a dusty road. 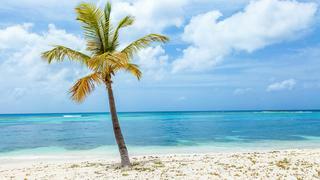 Yet Chatham Bay Beach is every bit as sparkling as you imagine the Grenadines to be. The turquoise lagoon, the white sand and the backdrop of pure green forest makes for as idyllic a landscape as you could hope for. The neighbouring shores of Bloody Bay and Campbell Beach are also great for snorkelling, turtle watching and sipping cold beers with the locals. More rugged than its Grenadine rivals, Union Island is a place where rum shacks pop up, restaurants serve home cooked fare and the best mangoes can be found from a vendor on the side of a dusty road. 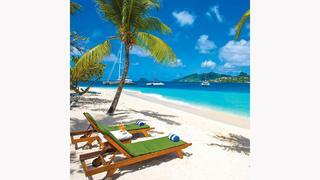 Yet Chatham Bay Beach is every bit as sparkling as you imagine the Grenadines to be. The turquoise lagoon, the white sand and the backdrop of pure green forest makes for as idyllic a landscape as you could hope for. The neighbouring shores of Bloody Bay and Campbell Beach are also great for snorkelling, turtle watching and sipping cold beers with the locals. With no way of touching down in Mayreau other than by boat, it’s no wonder that the beach at Saltwhistle Bay has become something of a Holy Grail for travellers seeking semi deserted shores cut off from the outside world. The silvery crescent of sand is laced with deep, dark and dense jungle, the waters are teeming with marine life, and the aptly named The Last Bar Before the Jungle is an iconic yachting watering hole. When you get tired of snorkelling you can head by foot along the paths that cut in deep into the jungle until you find the only village on the island. Climb to the tip of the Catholic Church for staggering views before making your way back for a seafood supper. With no way of touching down in Mayreau other than by boat, it’s no wonder that the beach at Saltwhistle Bay has become something of a Holy Grail for travellers seeking semi deserted shores cut off from the outside world. The silvery crescent of sand is laced with deep, dark and dense jungle, the waters are teeming with marine life, and the aptly named The Last Bar Before the Jungle is an iconic yachting watering hole. When you get tired of snorkelling you can head by foot along the paths that cut in deep into the jungle until you find the only village on the island. Climb to the tip of the Catholic Church for staggering views before making your way back for a seafood supper.